Cats are fascinating animals with many ideas when it comes to things they can do around the house. As a cat owner, you surely know that finding cool toys to provide lots of fun means less useful objects damaged. If you are looking for a cool cat gadget, there are endless options available on the market and doing the necessary research before making the right choice can be time-consuming. Knowing this, we decided to help you out by making the selection below. We all know that cats just love scratching things. This habit helps them maintain their claws sharp and healthy, and it also plays a part in territorial marking. So before you try to find a way to make your four-legged friend stop, take a look at this cat scratcher. Petmate’s product is made of natural and recyclable materials, including high-test organic catnip, meaning that your cat can enjoy it without any health risk. The ramp provides a good angle, while the reversible cardboard scratching block can be turned around for a fresh side. The flower design blends into most decors so it’s easy to place anywhere. This is a great choice if your cat spends many hours alone in the house. 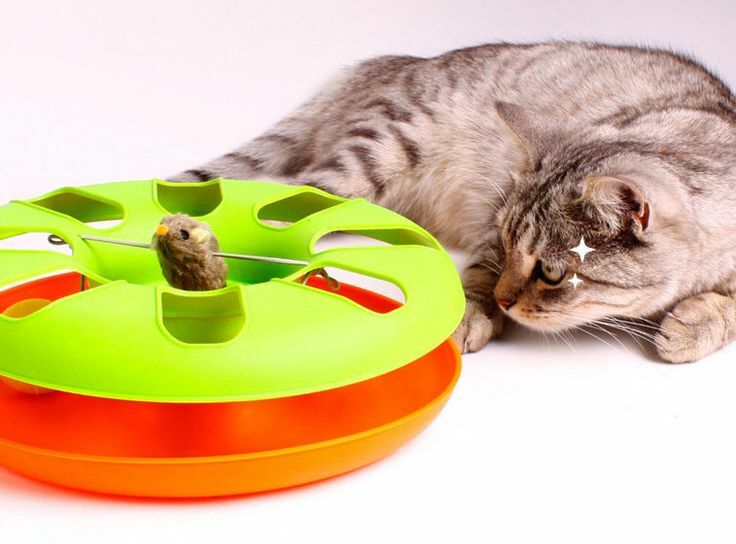 The exciting ball track offers hours of entertainment, meaning that your cat will not be bored, with all the chasing, batting, and playing she can enjoy with Petstages’ game. The hidden ball inside sparks interest and can keep your determined pet busy for long periods of time. In case you are wondering if this product is safe, then know that it’s non-toxic and lead-free. The catnip filled mouse attracts interest even more, while the non-skid pads at the bottom provide stability for the entire play station. Catit’s Roller Circuit is the ultimate toy if your cat is very active and likes to play all the time. The large track is made of 8 pieces with alternating high and low sections, taking fun to the next level. We all know cats just love things that move, but what about things that move and have lights? The motion-activated balls light up and zip inside the track, while large openings along the circuit allow your pet to reach in and touch the ball. The design propels the ball at high speed, making this a great exercise stimulator for our feline friends. This teasing wand is a great option if your cat is highly energetic and runs around the house all the time. The bee attached to the wire provides lots of fun and a great deal of exercise, while at the same time being so entertaining that your four-legged friend will not get bored. In case you were wondering, the product doesn’t have any feathers attached to it, but the bee is extremely attention-grabbing. The sturdy wire resists multiple rounds of playing and pulling, so if you want to enjoy some aerial acrobatics from your cat, then give the Teaser Wand a try. If you want to protect your furniture from getting scratched, then Catit has a solution. This fun and stimulating scratcher provides a safe place where your cat can go and sharpen her claws for as long as she wants. This also brings some health benefits through exercising. The product consists of a corrugated cardboard scratch pad, a tracking ball, and even a spring-mounted pom-pom, for extra fun. Its size makes it easy to move around, and it can be placed anywhere in the house. Moreover, the pad has two sides and it can be easily flipped over to the unused one after a while. This product is one of those that makes your cat work for her food or treats in a fun way, by encouraging her inner hunter to search for food. The design activates the cat’s natural pawing behavior in a playful manner while reducing binge eating. You can insert treats into the different tubes that have varying degrees of difficulty. By doing this, you activate her touch, smell, taste and eyesight senses. The design makes this product easy to clean, while sloped surface collects stray pellets and prevents spillage. Combine this product with a great cat bed and have the perfect mix of fun and sleep. Cats need a lot of mental and physical stimulation in order to live a long and healthy life. In the wild, they achieve this by hunting, but when they are indoors, they need the right toys to keep them active, entertained, and fit. Play-N-Squeak’s product provides lots of fun for your cat and keeps her in shape, as running and jumping are the two main activities involved in this interaction. The patented electronic sound module that produces a realistic mouse squeak is sure to maintain a sparked interest. Moreover, the catnip filling is also appealing, and your friend will surely be busy while you’re away. Iconic’s interactive toy emits a laser beam on the floor or on the walls, so you can only imagine what this means in terms of physical activity and entertainment. The speed can be adjusted between slow, fast and random, which makes this suitable for cats with different levels of energy. The product is made of tough ABS eco-friendly plastic that ensures durability, meaning it can be enjoyed for a long time. The laser beam features 3600 patterns and combinations, making this an ever interesting activity for a cat. Furthermore, the device’s settings automatically turn it off after 15 minutes. Cats are, before anything else, members of the feline kingdom. This means nocturnal hunting is part of their DNA and behavior. However, this is one skill that might not be used very often when living in a home. If you ever wondered how these fascinating creatures can be entertained during the night, then keep reading further. This OurPets Mouse Play Wand features the RealMouse technology, and the toy squeaks when cats play with it. Moreover, for the inner nocturnal hunter, the eyes flash, making this a great toy which provides a lot of entertainment. The catnip filling also ensures a spiked interest. The emotional relationship between a cat and her owner is very important for harmonious development and a healthy life. And what other way to do this than by spending quality time together, playing and bonding? Petmate’s wand is designed to do just that, as you can dangle the character for your cat’s entertainment, in an interactive play. Moreover, the organic catnip inside ensures both safety and a maintained interest level. The product is sturdy and durable, which means that it will put up with a great deal of playing, and your cat will have fun without biting through the string. They say cats don’t have owners, they have slaves and, in more than one aspect, this saying tends to be true. It is also said that the cat picks you and your only duty in this world after having a cat is to treat her royally and offer her the best a mortal could. Nevertheless, having a cat as a pet is a huge responsibility because they tend to be quite pretentious and properly looking after them will end up costing you quite a lot. Apart from the gourmet food and a balanced diet you also need to keep an eye on special grooming products, visits to the veterinarian, yearly vaccines, and medicines, as well as cool beds and toys that will stimulate your cat’s creativity. Most apartment cats don’t do enough exercises daily, so they will easily gain weight if you don’t find an interesting way to help them exercise while staying indoors. So, if you’re looking for some cool cat toys to buy but don’t have the necessary time to wander through pet shops yourself, the following comprehensive buying guide will hopefully offer you some good solutions, as well as the most important tips in looking for the right type of toy. Finding the best cat toys could prove quite a difficult task, especially with countless options available on the market, for all breeds and ages, and for all pockets. However, if you want to make sure you did the right choice and ended up with some good cat toys, we suggest doing some research first. You could start with online forums and blogs of cat owners that will provide you with some good cat toys reviews, and tell you which types of toys will best fit your furry bundle of joy. There are also plenty of products available for sale on online shops, so don’t forget to take a look there too if you want to make sure you choose the best catnip toys. Cats love to be challenged and to climb things but they can also be extremely lazy which causes them enough health issues. Without a minimum of effort chasing around mice or running around the house, your cat will soon become overweight and even obese, even though you closely monitor its daily intake of food and diet choices. But, even though you don’t have real mice your cat can chase around the house, this doesn’t mean that your cat has to know this. So, why not take advantage of the best electronic cat toys on the market and purchase an electronic mouse? It looks like a mouse and is certainly fluffy as one, and even comes with two different modes – the “paw” mode and the “chase” mode, depending on your preferences. Docile cats can enjoy the company of an unusual friend and allow the mouse to be set on the “paw mode”, while active hunters and predators will certainly benefit from the “chase mode”. The product also comes with a rubber tail that twitches as it moves to determine cats to see the toy and start running after it. This furry toy mouse runs on regular batteries and won’t cost you more than 10 dollars, which means it is an affordable and extremely challenging toy for your cat. If you have enough room for your cat’s belongings and understand the necessity of your cat exercising, we suggest buying a cat claw perch. This heaven for cats is composed of various cat towers, all of equal or different heights which your cat can safely climb. There are some attached toys to each corner of a cube composing the tower, and plenty of possibilities to play and exercise. This is a complex and extremely useful workout toy that will determine your cat to increase its agility and climbing techniques, while still having plenty of alternative toys to play with, and even some comfortable and great cat beds to fall asleep in after exhausting climbing routines. What we love about this type of towers is that you can choose from a variety of colors, heights, and complexities, so that you can even end up with a full-scale labyrinth and play zone. It is the perfect gift if you have more than one cat because you won’t be seeing these paw friends anywhere else than the playground. Cat toys come in countless shapes, sizes, models, and materials so that each cat can find its personal favorites. In order to make sure your cat has everything it needs, we suggest taking into account some additional aspects too. For instance, one way to monitor your cat’s daily activity and make sure it is always ok is to appeal to new cat collars made from natural fabrics and with bold designs or signature colors to easily locate your cat. You also need to take into account your cat’s safety, especially when it comes to toys. As a general rule, we suggest buying only from certified producers and avoid improvisations which can easily turn disastrous. Don’t purchase toys with small pieces that can easily be chewed or taken off as they represent real choking hazards. Also, make sure all the materials used for manufacturing are safe and chemical-free. If you can choose products with organic dyes or made from natural fabrics it would be best. Also, make sure to keep your feline toys all stored in one place and not spread throughout the house, especially if you also have little children. Cats tend to be quite destructive creatures so it is also advisable to take a look at a toy’s durability. 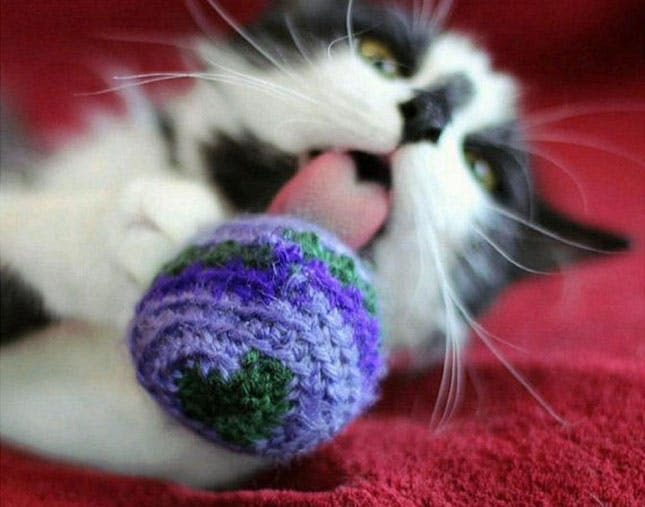 Cat balls and other “old school” toys tend to be the most resistant because they are made from the simplest of materials and don’t include any piece of technology that can be destroyed or torn apart. On the contrary, other toys, no matter how charming they may look on the exterior, they will soon prove quite useless if they fail to pass the durability test.